RK Machinery has long been focused on the safety of the workers operating its presses. The new wireless remote adds an extra layer of protection for the press operator. Using it, he can stand back and operate the press well out of the way of any danger. He can do this without sacrificing precision. The remote provides accurate, exact control from many feet away. The unit provides active safety checking constantly during operation. The wireless remote has a long pistol grip that is easy to handle and control. The trigger is proportional and has a long throw. Because it is contactless, the house stays sealed. The speed control is precise. Just a glance at the onboard diagnostics will tell you if your have a solid radio link and if there are issues with your machine. You get real-time feedback as you operate the press. The remote uses intelligent power management. It operates with a rechargeable battery pack or replaceable AA batteries, which provide days of dependable use. As long as your unit is configured for it, a wire tether cord can provide power if your batteries are shot. The low battery indicator gives you ample warning is you need to charge your power source. 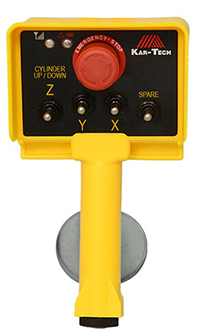 RK Machinery proudly offers our new handheld remote. If you have questions or would like to get a closer look, contact us.